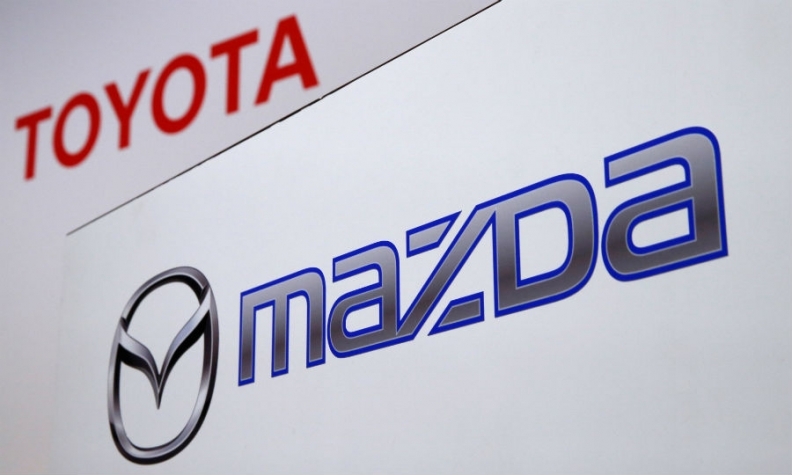 TOKYO – Toyota will partner with Mazda and auto parts supplier Denso to form a joint venture for developing electric vehicles, as Japan’s biggest automaker plays catch-up in the expanding race for battery driven cars. The new company, called EV Common Architecture Spirit Co., will cooperate on developing the architecture and components of electric cars for use in a wide range of segments, from minivehicles and SUVs to light trucks, the companies said on Thursday. The partnership will create a toolbox of components that both Toyota and Mazda can dip into when making their own electric vehicles. The deal builds on a fledgling alliance between the country’s largest automaker and one of its smallest that was cemented in August. The companies announced a capital tie up then, saying they would work together in a variety of fields, including electric cars. Toyota Executive Vice President Shigeki Terashi said at the time that sharing technology would give Mazda and Toyota extra volume and drive down costs. Terashi was tapped to head the new venture as president. The companies said increasingly stringent emissions regulations were forcing carmakers worldwide to develop electric vehicles. But the high cost of electric cars, driven partly by their expensive batteries, makes it necessary for erstwhile rivals to pool resources. The new venture, they said, will be open to participation from other automaker and suppliers going forward. “The huge investments and time required to cover all markets and vehicle segments is a pressing issue for individual automakers,” the companies said. "New regulations that mandate a certain proportion of electric vehicle sales are beginning to emerge." The industry’s frenzy for EVs was on full display around this month’s Frankfurt auto show. BMW, Mercedes-Benz and Volkswagen were among the makes rolling out ambitious plans to unleash waves of EVs over the coming years. Jaguar Land Rover weighed in with plans for full electric and hybrid cars from 2020, and Honda unveiled its next EV. The new Toyota company will pull select engineers from all three companies and have about 40 employees. It will be based in Toyota’s high-rise office building in downtown Nagoya. Toyota will wield disproportional influence. It will hold a 90 percent stake in EV C.A. Spirit, while Mazda and Denso each take 5 percent. The two directors under Terashi also come from Toyota. They are Kiyotaka Ise, head of Toyota’s advanced r&d and engineering, and Toshiyuki Mizushima, president of the carmaker’s powertrain sub-company. Toyota long remained skeptical about EVs in favor of the hybrid technology pioneered by its flagship Prius, as well as the potential for hydrogen fuel cells. But the automaker finally joined the EV race late last year when President Akio Toyoda put himself in charge of a new EV Business Planning Department. It was envisioned as a flat, fast-moving organization to mimic the nimble corporate culture of the Silicon Valley startups. At its helm were just four people, including Toyoda and counterparts from Toyota Group suppliers Aisin Seiki, Denso and Toyota Industries. That EV planning department will remain, while the new JV incorporate elements of its work and feeds new EV technology back into it. Mazda and Toyota develop their own EVs off the joint venture's architecture. "Each company will be responsible for the development of specific vehicles, and the procurement of parts will be unaffected by which suppliers participate at this fundamental technology development phase," Toyota spokesman Jean-Yves Jault said. "Each company will have complete freedom to make its own decisions about product development." Toyota is expected to start selling new EVs in China within the next few years. The company also has said that in the early 2020s, it intends to introduce vehicles with next-generation solid-state batteries, which enable faster charging and longer range. Mazda has said it plans to launch an EV in 2019, but Mazda doesn’t have the deep r&d pockets for elaborate development. Mazda doesn’t currently sell an EV and its only hybrid offering is a version of the Mazda3 small car and that is only offered in Japan. It relies on a system designed and engineered by Toyota. More than two years after inking a loose tie-up, Toyota and Mazda agreed to take capital stakes in each other last month. Toyota said it would take a 5 percent stake in Mazda, while Mazda reciprocates with a token 0.25 percent stake in Toyota. The closing of ranks comes as Toyota says it is shifting into “offensive” mode to ward of new rivals from outside the industry and invest more in next-generation technology. As part of Mazda deal, the carmakers will build a joint-venture assembly plant in the U.S. The plant will have production capacity of 300,000 vehicles a year, with half going toward the Toyota Corolla and half being dedicated to Mazda for crossovers and SUVs.